The recently held National Transport Summit, forefronted by the Elmer Francisco Industries (EFI) thru Elmer Francisco of the seasoned and well-established Francisco Motors Corp. at the SMX Convention Center in Pasay City, was meant to put all heads together—PUV operators, jeepney drivers, stakeholders, and government transportation agencies—to create a viable plan to get the PUV Modernization Program going. Quite a number of PUV operators and drivers came to the Summit on a mopey outlook; they came to put in their sentiments and apprehension on a subject they are most prickly about: a generalized uneasiness of losing their source of livelihood in the face of an eventual jeepney phase out. As of the last count, there are about 260,000 franchised jeepneys that provide a fast, accessible, and cheap mass transportation. Put in an unnumbered colorum units, barkers, starters, car wash boys and jeepney night watchers and we will have a first-hand idea of the Program’s impact on some lives. At the same venue and time, a more encouraging event started the afternoon on a bright rhythm. 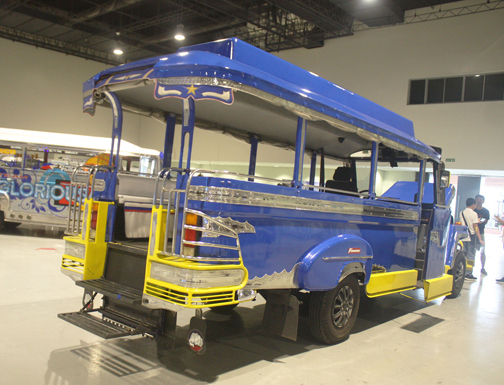 The EFI Jeepney Expo, with a working theme of Mobility, Opportunity, Vision, Environment (MOVE), exhibited a number of new, revitalized concepts with substantial restyle. Gleaming and looking all set to rip the roads, EFI’s exemplars of a modernized PUV would transport people and goods conveniently and ecologically by using Earth-friendly electric battery (which only requires 15 minutes of charging and has 10 years of good life), Euro 4 compliant engines, and LPG gas. The models have side door curb side entry following the Program specifications but with an added sensible twist: there is a back side exit door, kept close when the unit is in motion for easy egress in emergency situations. EFI’s jeepneys, in their straightforward styling, would somehow tame down the old jeepney culture and the loads of gimmickry stuff, visual and audio eccentricities --- the curtains, plastic flowers, fluttery interior lights, and wake-up-the-dead music blast --- and fade away like their ascendant Willys Jeep. Prototypes of the modernized PUVs under the Modernization Program launched in June 2017 have been previously shown to the public. For starters, two major assemblers have presented their versions of the transformed PUVs. Mitsubishi’s BEEP is a minibus equipped with Euro 4 compliant diesel engine, forward facing seats and plenty of head room with roof rails. 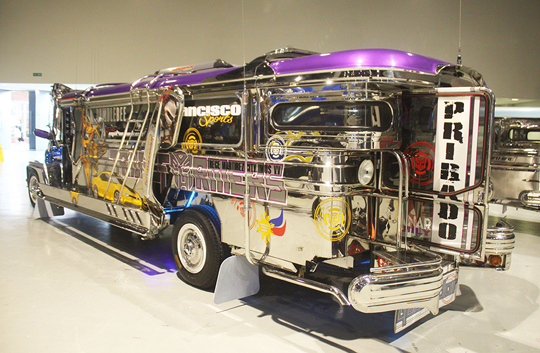 Centro Body Builders incorporated the same forward facing seats and threw in some splashes of multicolor jeepney themes. Each unit is a visual treat, came up long on wow factors like snazzy exterior details and cheerful colors. Keeping close by are Almazora, Del Monte, Hino of Japan, Tata of India, and Foton of China, each with a defined version and specifics to be able to qualify as the third entry under the DTI CARS Program. If the PUV Modernization Program were up to its intended run, each revised unit will have quite a number of updates: automated fare collection system, digital security and dashboard camera, WiFi Internet connectivity, GPS tracking device, and speed limiters. As for passenger comfort, each unit will have air conditioning and wider aisles. All good stuff for a minimal fare increase shouldn’t be a huge dent in the pocket when the safety and convenience of the riding public is the centerpiece of such jeepney culture shake-up. At the Summit, all heads agreed to smooth out all areas which have been sources of strain since Program was advanced. The biggest roadblock, by a collective unanimity, is the cost of the modernized unit, about Php1.8M minus the Php80,000 government subsidy. (To be able to avail themselves of this plan, the old jeepney will have to be surrendered, sort of a trade in, whereas the jeepneys are to be sold to a country which has less sophisticated mass transport system the likes of Sri Lanka.) A single-unit PUV operator, they insist, will not be able to afford the cost, contending that the present boundary system of renting out his unit is only at an average of Php600 daily, barely enough to cover cost of spare parts when the unit breaks down. Mamita Lorenzo of the Luzviminda group, George San Mateo, National President of Piston, Orlando Marquez of LTOP, and Elmer Francisco, while in agreement that the present PUV mass transit system needs a well-grounded overhaul, believe that the PUV Modernization Program does not answer all the questions that require reality-based resolutions. Transportation OIC Undersecretary Mark de Leon likewise acknowledged that the Program --- howbeit has for its consideration the reduction of the traffic jumble and the financial well-being of operators and drivers --- has more objects of note, pros and cons, to reconsider and hammer away at. To cite: a government agenda or initiative proposed by drivers, operators and local assemblers for a national industrialization of the manufacturing sector to do away with importation of parts by utilizing the country’s resources vis-à-vis exporting to/importing back iron and steel; phasing out jeepneys 15 years old and above and replacing them with minibus style PUVs; preserving the Pinoy touch and the traditional jeepney art genre the world has become used to and admired as “only in the Philippines”. Hence, follow-through deliberations and similar summits are in the works to finally arrive at a mutually acceptable conclusion prior to full resolve the contested PUV Modernization Program. Staying true to traditions can’t be a bad idea, but technology and actually doing something to help maintain a continuity of mass transit orderliness necessitates a dramatic leap. The government, PUV operators, drivers, and private industry movers the likes of Elmer Francisco and his Group deserve high marks for trying to plod through all these screeches and bleating horns.